Some two decades back , life was not so hectic as it is today . Men use to do 9 to 5 job , women were mostly homemakers , staying at home and taking care of family needs . There was not much pressure of studies also. People were not in MAD RACE to earn surplus money and be ahead of others. Most of the people were living simple life and were happy and satisfied , I agree there were some financial problems but that was also tackled efficiently with patience and proper planning . But now Scenario has changed , people are in a Mad race to earn more and more money , to be ahead of everyone in their circle , be it be their friend circle or relatives , they want to outshine . This has resulted in Stress related problems , because money does not comes easily . Change in lifestyle has also increased many stress related problems. BPO’s , Call centres , IT industry , Health sector all have work hours in shift rotation that includes night shifts as well .So people working in these shifts get stressed because of lack of sleep and are first ones to have stress related problems like high BP , Sugar , anxiety etc. Then the madness to earn more and more money add to their woes. I was reading an article on Rewardme.in on 8 Ways To A Work Life Balance . 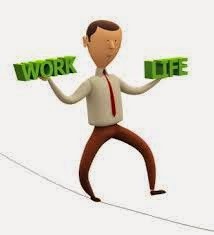 Its a good article which explains how to Manage your time and maintain Work life Balance. Every body gets that 24 hours in a day but some people manage their time so well that they have time for everything , for their family , friends , Social life , Job etc. They mess up their life and are unhappy . So its very important to learn how to manage your time well so that we have time for everything. One Golden rule for this is WORK WHILE YOU WORK AND PLAY WHILE YOU PLAY. When at work we should be very careful and attentive so not to do any mistake there and try to finish our work quickly so that we are free to do other things . When spending time with family and friends , it should be a Quality time , enjoying each and every moment of it . Specially with your kids the spent should be memorable because it has deep impact on their psychology , Kids want emotional bonding with their parents , so it should not be that while with kids we are busy chatting with some one on phone or checking our mails , it should be a quality time , talking to them , listening to their queries and problems . Following these simple rules we can manage our time efficiently and easily maintain work life Balance , which is ultimately good for our health and relationships.